I loved The Death of Bees, so recently I looked to see if Lisa O’Donnell had written anything else. Closed Doors did not disappoint. 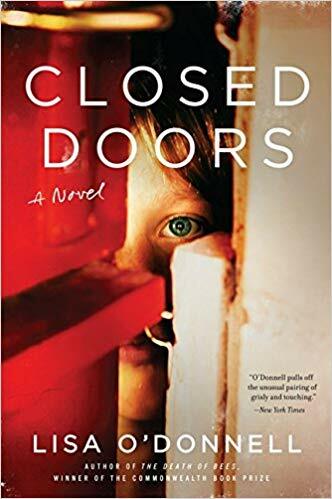 The action of the novel, set in the 1980’s, begins when eleven-year-old Michael Murray’s mother comes home with cuts and bruises on her face. She says she’s been assaulted by a flasher and fell. Mike’s Da urges her to go to the police, but his Ma is worried about the vicious gossip in their small island community off the coast of Scotland. She makes the family promise to keep her secret (which, we sense, is worse than a flasher), but the neighbors all assume that Michael’s Da beat her up. The ramifications of the lie continue with strained relationships with the neighbors. Then, another woman is assaulted. Now, Michael’s Ma is afraid she won’t be believed because she waited so long to talk. In the meantime, she suffers from anxiety and fear of being touched or looked at. Michael’s voice is absolutely convincing as a naive boy who doesn’t quite understand what’s going on. This book is sometimes harrowing, but it is also touching and funny. Another great book for O’Donnell. Goodreads has Benediction listed as Plainsong #3, which makes me wonder what that means. The first two novels in the series, Plainsong and Eventide, were very closely related, but this one not so much. All three of them are set in Holt, an imaginary town in Eastern Colorado, but then again, all of his novels are set there. Yet, these three novels all have titles related to religious services and song. Dad Lewis is dying. That’s the central focus of the novel. But this novel even more than the others provides a picture of small-town life by looking at the neighbors and others in touch with Dad during his last weeks. Dad is loved by his wife Mary and daughter Lorraine, but his son Frank has long since disappeared from their lives. When Frank was a young man, Dad was not understanding at all about his homosexuality, and that conflict eventually resulted in a complete break. Dad is also perhaps not being fair to his long-time employees. When he was 22, his boss gave him an opportunity to buy the hardware store, and he has owned it ever since. Now he wants a reluctant Lorraine to take it over instead of extending the same opportunity to his two employees. There are other things Dad frets over and even hallucinates about, but the novel isn’t just about Dad. The Lewis’s next-door neighbor Berta May has taken in her granddaughter Alice after her daughter’s death. Lorraine lost her daughter years ago, and she and retired schoolteacher Alene take Alice under their wings. Reverend Lyle has been sent to Holt after a problem in Denver. His wife and son John Wesley are unhappy in Holt, and soon Lyle begins expressing opinions that leave some of the town in an uproar. This novel is written in Haruf’s lovely spare prose. In theme and plot, it seems more diffuse than his other novels, but it is profound and moving.